Edgar Jones, Ged Lynn, Paul Maguire reform The Stairs. The Stairs - as part of 'Le Beat Bespoke 11' - Thursday, 24th March, 2016. The Stairs are back from 20 years of hibernation, refreshed and once again armed with their exciting hybrid of cosmic psychedelia, raucous R&B and ’60s west coast garage sounds. Reforming for a one off show in their hometown of Liverpool back in November 2015, The Stairs – led by bassist/vocalist Edgar ‘Summertyme’ Jones (The Joneses, Paul Weller, Johnny Marr) and accompanied by original band members Ged Lynn (guitar/vocals) and Paul Maguire (drums) – cooked up a storm to a sold out crowd and gained exceptional acclaim with many lucky attendees citing it as the best performance they have seen by any band in years. 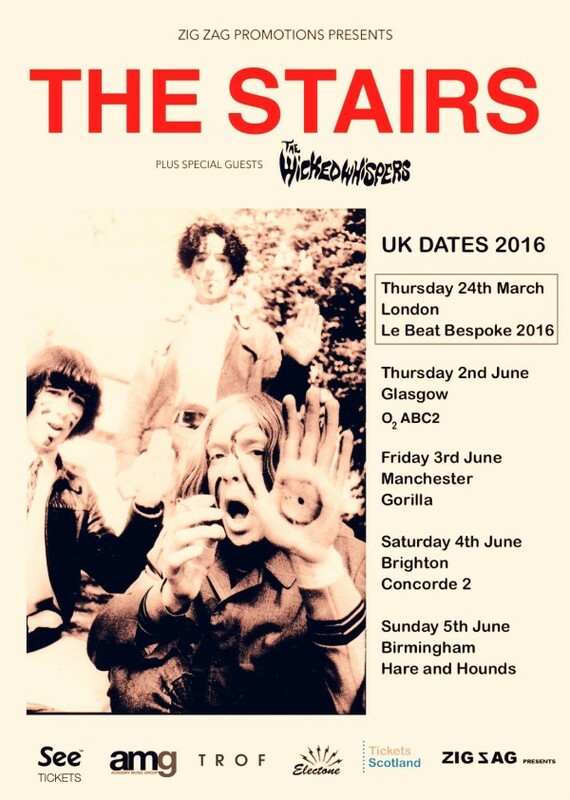 Due to popular demand The Stairs have announced a small 2016 UK tour that will take place this summer on the back of their Le Beat Bespoke performance, stopping at Manchester, Glasgow, Brighton and Birmingham! Expect to hear favourites from their classic cult album Mexican R’n’B as well as new material and unexpected rarities. 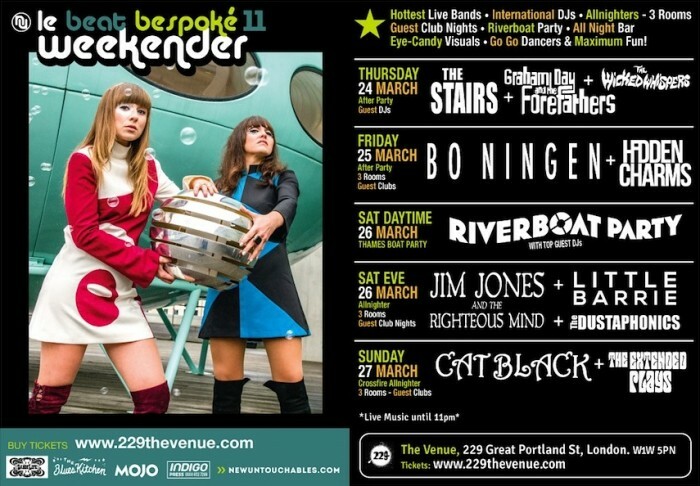 Fellow psychedelic scousers The Wicked Whispers will be in support (and also performing with The Stairs at LBB). Following the release of their critically acclaimed debut album Maps Of The Mystic (“Psychedelic and interesting” – Huw Stephens, Radio 1) the band will release their brand new double A-Side 7” single ‘Zodiac Girl’/’If I Set You Free’ on Electone Records this June.